Our new Community Memorial Hospital Maternal Child Health unit features the caring experts you know and trust in an expanded, modern environment. As the area’s leading birth center, we know how important the health of our youngest patients is to our community. That’s why our new Community Memorial Hospital (CMH) features an entire floor devoted to the well-being of moms, babies, and children! 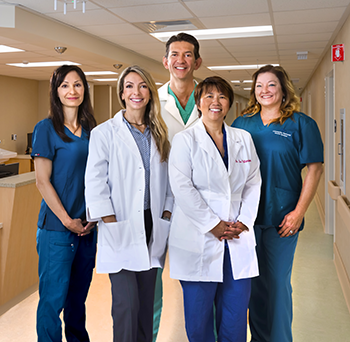 Located on the third floor of our new CMH Ocean Tower, the modern and spacious Maternal Child Health unit now matches the caliber of the award-winning maternity, postpartum, and pediatric care our physicians and staff are known and trusted for. 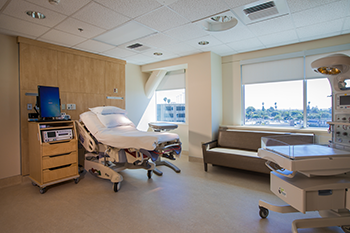 The maternity wing features 11 expanded birthing suites with private bathrooms, plenty of space for family members, scenic Ventura views, and abundance of natural light. Seven of these birthing suites also include bathtubs, providing extra relaxation for laboring moms when needed. All-private postpartum recovery rooms await new moms, dads, caregivers and family members so they can get to know their new little ones in a comfortable, supportive environment surrounded by expert pediatricians, postpartum nursing teams, and lactation specialists. Our new birthing suites are spacious, comfortable, and full of natural light. For preemies and infants who need extra care, our new CMH features a Level III Neonatal Intensive Care Unit (NICU) located just down the hall from our birthing suites and postpartum recovery rooms. Community Memorial Hospital’s existing NICU opened 24 years ago and offers an extremely high level of care. Expanding from 16 beds in the existing hospital to 23 in the Ocean Tower, our new NICU also includes two private NICU suites for one-on-one care and a dedicated procedure room. 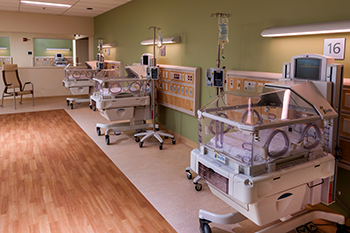 The Level III NICU in our new Community Memorial Hospital has been expanded from 16 beds to 23 beds. Our new Maternal Child Health floor is made complete by an eight-bed pediatric unit to meet the healthcare needs of the children in our community. This unit is outfitted with a playroom for patients, an exam room, and specially selected whimsical, light-hearted artwork chosen to sooth and comfort our youngest patients. Whether welcoming a new addition to the family or caring for a sick child, moms, dads, caregivers and family members will feel comfortable and supported at Community Memorial Hospital. Not only are we a designated “Baby-Friendly” Birth Facility, but we have been recognized with the IBCLC Award for Excellence in Lactation Care, the Blue Distinction Center for Maternity Care award, and remain a leader in safety practices for moms and babies! CLICK HERE to learn more about Maternity & Delivery services at Community Memorial Hospital, as well as our New Parent Resource Center, which offers ongoing education and support for moms, dads, and caregivers!